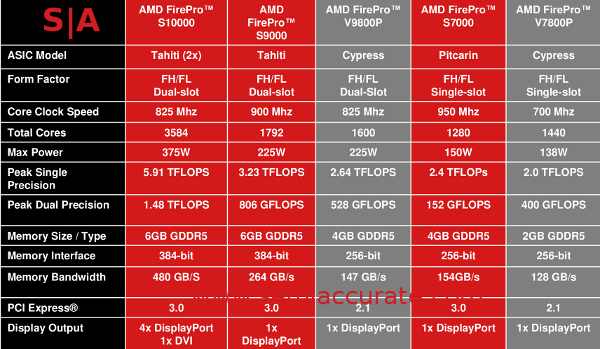 Remember that dual Tahiti Firepro SemiAccurate wrote about in August? It came out today and is called the Firepro S10000, but it isn’t what you expected it to be. The S10000 is indeed a dual Tahiti card, a derivative to the late lamented AMD New Zealand card that everyone was expecting to come out last spring. This new card is most of New Zealand, but aimed at a very different market, Virtual Desktop Infrastructure (VDI). We told you about the predecessor part, the S9000 earlier, if you put two of them on a PCB, lower the clocks by 75MHz and drop memory speeds by around 10% as well, you have an S10000. 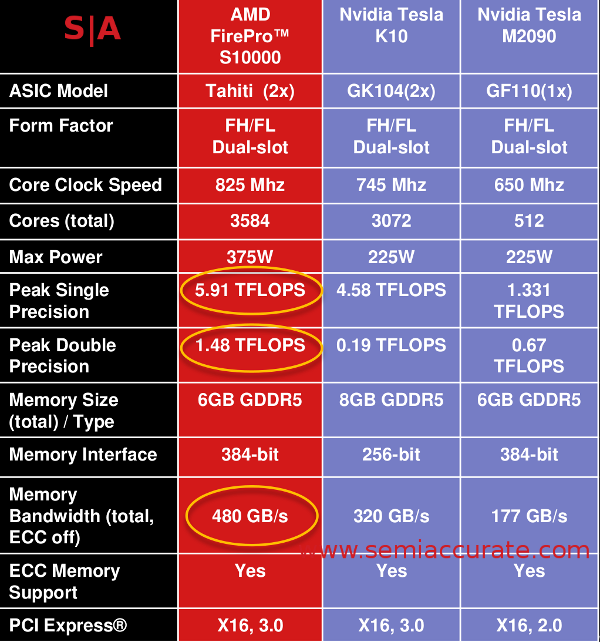 It sounds good, see the specs below, but there are a few red flags. 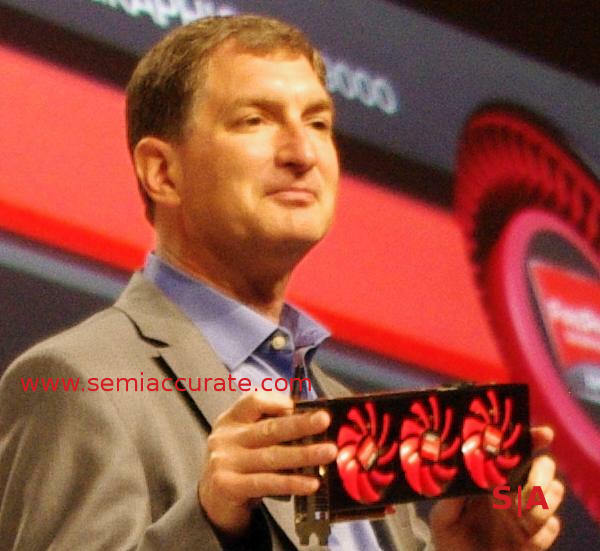 The first thing that jumps out at you are the fans, and they are there for a reason, that being a 375W TDP. PCIe2 is said to have a 300W per slot limit, that may have been raised with PCIe3 or it just might not be relevant, SemiAccurate has not gotten a clear answer out of anyone about the exact limits currently. In any case, the PCIe2 and PCIe3 slots can both supply 75W, and two 8-pin PEG connectors each push 150W, so 375W is not a big deal to supply. Since these cards are 100% sold through system integrators, there won’t be a cooling problem, the chassis will be specced for them, not the other way around(1). 375W is not a problem for that reason. If you look at the specs of the S10000 compared to the Nvidia Tesla M2090, the S10000 crushes the M2090 on DP FP performance per watt by about 33%, and the K10 fares far far worse due to it’s abysmal DP performance. On SP FP the S10000 about doubles the M2090 on performance per watt, but loses to the K10 on that count fairly comprehensively. If the K20 comes out with the specs that C’t discovered, it should trounce the S10000 on DP performance per watt, and be a little ahead on SP performance per watt. Back to the raw numbers though, the S10000 should win handily on raw performance in both categories, and win in every density related metric too, but not by much. That is the reason why AMD is putting all the emphasis on VDI, purchases there are heavily based on the number of users you can assign to a server. Management and related TCO costs matter in this arena, and that plays well to density and raw performance. In that regard, the S10000 has a niche, but it isn’t a big one even if it can be very lucrative. It all depends on where Nvidia prices the K20 card vs the $3599 of the S10000. Getting back to the tech, there is one more setting that we didn’t expect, the similarity but not quite exact match to New Zealand. The AMD dual Radeons of late have all been hardwired to CrossFire mode, they are seen as one GPU to the system. This allows AMD to play all sorts of tricks like Zero Core Power, one GPU awake is more than enough to power a system. With VDI you have multiple users, and the software ranges from barely working (Microsoft) to tolerable (VMWare and Citrix), but each has it’s own set of drawbacks with how users are mapped. If you allow direct hardware acceleration of a VDI session, it usually means a 1:1 mapping of users to VMs. Crossfire is a distinct negative here, you would essentially halve your user count per card. In any other mapping with multiple users in a many:1 scenario, putting a GPU to sleep increases latency to frightening numbers. Short story, CrossFire is a bad idea in both cases as are power related tricks. You could make specific cases for them, but in servers and VDI it is almost always a losing proposition. This is why both technologies went bye-bye in the S10000. (1) We know there is a retail SKU for the S10000. We asked about this and it was mainly a bookkeeping and sample distribution designator, they won’t be sold that way to the public.